This Texas Holdem Table has a full set of bumper pads around the table. The pads are covered with a high grade mildew resistant black vinyl. 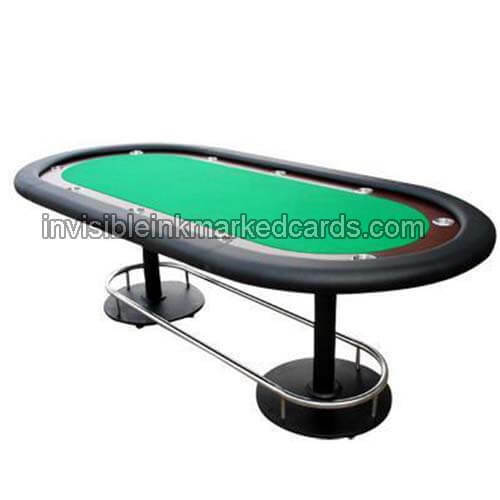 The table top is produced from a casino style high grade green felt. The table top is padded to give the players the highest comfort level. Under the table top are two foldable wooden legs for support and easy storage. This professional-grade blackjack table is over 6.5 feet wide! Surrounding most of the table is a black vinyl padded armrest for the comfort of your guests. We use top quality felt with original casino layout. Pros would feel at home being at this table. This table is full of class and will look amazing in your game room. •	79" x 46"w x 36"h; 235 lbs.